Based on average of the daily cost for 3-day passes bought in the peak season. The biggest alpine skiing resort in North America guarantees to never let you down. With more than 200km of inviting slopes, the resort invites folk from all over Canada as well as the US, to spend their ski holiday in the beautiful Whistler Blackcomb ski resort. 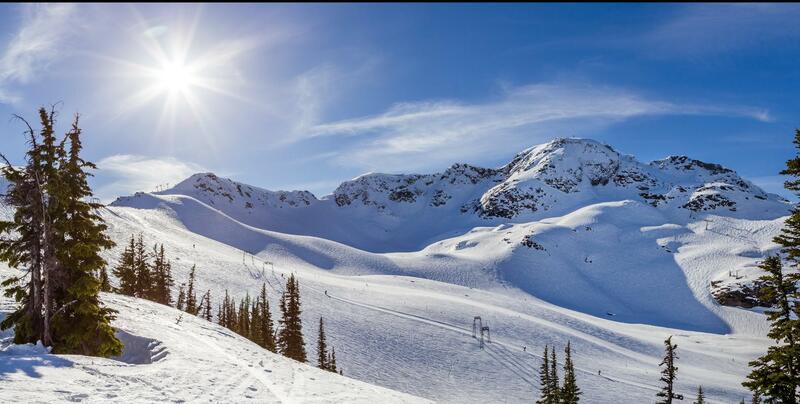 Whistler Blackcomb is for many most know for hosting the alpine skiing competitions in the 2010 Olympic games. But besides the mainstream event, Whistler Blackcomb is becoming increasingly more popular due to the vast possibilities within off-piste skiing and in particular Heli-skiing. Deciding to spend your next ski holiday in Whistler will most likely set you back a few Dollars - yes, it is expensive. However, once you passed, pinching out your last penny and are standing on the slopes, you will experience in person why Whistler Blackcomb is hyped as the greatest place to be in the Canadian wintertime. Whistler and Blackcomb are two majestic peaks adjacent each other. The two mountains are located in the Fitzsimmons mountain range and at the foot right between the two spikes, by the Alta lake, lies Whistler Town. Whistler Town undoubtedly holds some of the best hotel and accommodation options for the perfect ski holiday, and the town will most certainly keep you entertained when you aren’t skiing. The two summits were connected in December of 2008 by the peak 2 peak cable car, which by chance also holds the record for the longest and highest gondola service that goes peak to peak without support. A ride with the peak to peak cable car is a must when spending ski holiday in Whistler Ski resort. Whistler Ski resort contains more than 200 kilometres of slopes, with the majority (apps 110kilometres) being for intermediate skiers. The area is so diverse and skiers of all skill levels can certainly enjoy the slopes and ski to their heart’s content. The slopes are of very fine powder quality which skiers and snowboarders are attracted from all over the world. The 37 lifts are divided with 19 on the Whistler side and 17 on Blackcomb mountain. Additional 4 gondolas operate the resort - including the Peak 2 Peak gondola. Although Whistler mountain may appear majestic and the name itself indicates this as the primary skiing arena for your ski holiday, it is however considerably tame as compared to Blackcomb. Blue and green level skiers will thus find plenty of opportunities to enjoy their ski vacations on the Whitler mountain. The diversity actually makes it a perfect destination for those who just want to practice and polish their skills before they can ski some of the tougher slopes located on the adjacent mountain. Of the approximately 35 kilometres of slope which goes under the category "beginner" The Burnt Stew Trail, for instance, is a run that is truly rewarding for any rookie. No matter how long you want to stay here, you won’t run out of such runs to hone your skiing skills. Ego bowls, Green Acres, Marmot are others which are recommendable. While skiers with intermediate skills enjoy the greens just as much as the beginners do, blues are what truly make the whole experience beautiful and memorable. There are as many as 110km of slopes suitable for a skier who is neither a pro nor a newbie. Although some of the runs are categorized as green, then this can actually prove quite challenging for skiers from other countries. It is our firm belief that Whistlers has several of green runs which would have been rated blue or even red if situated in other regions. With that said, there are a number of blue runs that are actually perfect for beginners who wish to take it up a notch. One of our personal favorite runs includes the Saddle of the Whistler Peak Chair, but if you need a longer run Peak to Creek is highly recommended. It’s a tremendous 5,000 vertical feet run. So, if you are having a lazy day and plan to have no more than one run might as well go for a long one. All those talks about versatility aside, the true test of any terrain lies in the way it satisfies the most seasoned skiers. Approximately 50 kilometres of the Whistler runs are categorized as difficult or expert. We recommend trying the Dave Murray Downhill run on Whistler mountain. The run has previously been was chosen for several events including Super G Races and 2010 Whistler Olympics. There is at least one bowl that is considered and called ‘extreme’ by all the skiers who have ever chosen it. Aptly named the Couloir Extreme, it offers a breathtaking view of the Coast Range before the steep drop. On the Blackcomb mountain, the "Spanky Ladder" run is one you need to test. The Spanky Ladder run gives you access to the "Ruby", "Garnet", "Diamond" and "Sapphire bowls". Whistler is particularly is known for the way it comes to life after dark. As they say, there is never a dull day - or night - in Whistler. From apres ski and all the way throughout the night, Whistler contains an immense amount of action. At the base of the Whistler Creekside is one of the oldest establishments – serving the locals and skiers since 1965. It is the home to the sunniest patio and was rebuilt in 2000. This spot is one of the favorites among the locals. Talking about aesthetics, this place looks like a classic western ski lodge with wood beamed ceilings and a very warm and comfortable fireside. This place enhances the ambiance with an excellent sound system and video systems. The Garibaldi Lift Co, or GLC, is popular and overlooks the base of the Whistler Mountain. This place has an exquisite theme which means that those of you who live to chill out at sophisticated lounges, restaurants, bars and clubs – GLC has everything. This place is ambient and if you’re lucky you might even bump into a few celebrities. For those of you who absolutely cannot live without having a pint of beer to lighten up your evenings look no further than the Brewhouse. The draught beer is brewed on the site and the kitchen produces dishes to make the perfect pairings – the north western style. Try a pint of Lifty’s ice-cold lager straight from the tap, which is typically a welcoming change from most of the Canadian domestic beers. Another highly recommended place is the Crystal Lounge. Located within the Crystal Lodge hotel, its arranging live music, band and other events throughout the season. Advice; make sure that you get there early due to the limited seating they have available. While Whistler invites you to a truly rewarding skiing adventure, it also gives you the opportunity to raid an amazing array of bars, discos, and nightclubs. Garfinkel’s, Down Under, Moe Joe’s and Tommy Africa’s are some of the places you absolutely cannot miss if you want to enjoy the nightlife the way it is meant to be. With more than 2 million tourists pouring into whistler each year, it is estimated that one-fifth of those visitors aren’t here for skiing. Here is a little bit about some of the other activities to enjoy in Whistler. Summer or winter, Whistler is never a dull destination whether you like skiing or not. Other than skiing, there are plenty of activities to enjoy. You can go camping under the stars and witness nature’s divine splendour, relax in heated swimming pools or spas, or enjoy a game of golf. If you are not into skiing, you can still enjoy the snow with activities like snowmobiling and dog sledding. You can even book a helicopter tour or Heli ice cave excursions. However, the best way to witness the beauty of the icy peaks is by taking a Peak 2 Peak Gondola ride from Whistler to Blackcomb. There are plenty of people who also come here just for the sake of ice fishing. The pedestrian-only village in Whistler is genuinely the most serene place to be. You can enjoy a delectable meal at one of the top restaurants in the town, you can shop for souvenirs, and ultimately you can hit a bar, and get a taste of the electrifying nightlife Whistler is known for. Popular ski resorts in Canada Looking for ski trips and vacation packages to Canada ski resorts? Have lots of fun skiing in Canada!